As per the Sanathana Dharma, Pushakaralu of River Godavari begins at 6.26 a.m on July 14' 2015 on Tuesday i.e on Bahula Trayodasi (13th day after full moon day) day in the Hindu month of Adhika Aashadam (additional month) when Brihaspati / Jupiter (one of the Navagraha who is believed to be Guru of Devas) enters the zodiac sign of Leo or Simha Raasi. The 1st half of 12 continuous days from July 14' 2015 to July 25' 2015 is celebrated as Adi Pushkaramulu and the 2nd half of 12 continuous days from July 31' 2015 to August 11' 2016 is celebrated as Antya Pushkaramulu i.e when Brihaspati leaves the zodiac sign of Leo and enters Virgo i.e Kanya Raasi. This year, Godavari Pushkaralu are termed as Maha Pushkaralu which occurs after 144 years. Pushkaralu for Godavari will last till Brihaspati remains in the zodiac sign of Leo. It is believed that a Holy dip in River Godavari during the Pushkaralu would redeem one from all sins , helps one in attaining Moksha / salvation i.e relieving one from the cycle of births and deaths and also helps one in entering into the higher strata of Astral world. 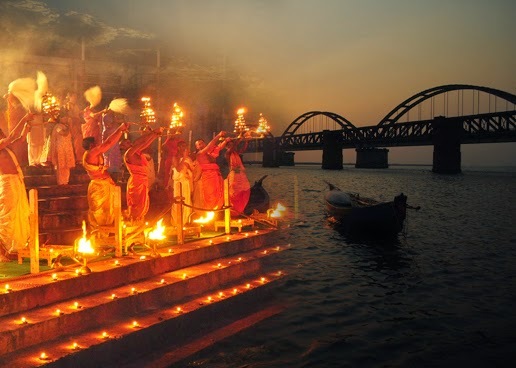 It is also believed that a Holy dip in River Godavari during Pushkaralu is equivalent to performing Ashwamedha Yaagam. As per the belief, people from the twin states of Telangana and Andhra Pradesh and from the neighboring states visit the places of Pushkaralu. The govt of the twin Telugu states are elaborately making all necessary arrangements for a successful celebration of the grand festival that occurs once in 12 years. River Godavari divides into 7 streams / tributaries before entering into the Bay of Bengal sea. A Holy dip in any of these streams gives equivalent to having a Holy dip in the main Godavari river. Tulyabhaga, Atreya, Bharadwaja, Gautami, Vruddha Gautami, Kausika and Vaishtha (or Vainateya) are the 7 tributaries of River Godavari and are popularly known as Sapta (seven) Godavari. The places where these 7 tributaries flow are regarded as holy places. Godavari originates in the Brahmagiri mountains in the Western Ghats. The river flows as 'antarvahini' i.e runs underground or concealed at Nasik in Maharashtra which is supposed to be its birth place / origin. It then flows out from a Gomukha (cow's mouth) shaped opening at Triambakeshwar in Maharashtra which one of the Dwadasa Jyotirlingas. It flows down towards east and enters the Deccan Plateau (Telangana) at Kandakurthi in Nizamabad district. It then flows South-East and enters the West Godavari and East Godavari districts of Andhra Pradesh. The river widens to the maximum extent at Rajamundry in the East Godavari Dist. Hence, it is also known by the name Dakshina Ganga or the Ganges of the South. Godavari is the second longest (also largest) river in India. The major tributaries of Godavari are Purna, Pravara, Indravati, Manjira, Bindusara, Sabari, Wainaganga and Wardha. After crossing Rajamundry, the river splits into two small branches viz. Vriddha Gautami and Vasishtha Gautami. In turn, Vriddha Gautami splits into Gautami and Nilarevu while Vaishtha Gautami splits into Vasishtha and Vainateya. The mouths of these four branches form delta before entering into the Bay of Bengal thus making the land highly fertile. The banks across River Godavari are known as Pushkar Ghats and there are nearly 67 Pushkar Ghats along River Godavari. Adilabad, Dharmapuri, Vemulavada and Bhadrachalam in Telangana have important Ghats. While Ram Kund, Dasak Ghat, Sangam Ghat and one under Kannamwar bridge are the important Pushkar Ghats in Nasik, Maharashtra. Pushkar Ghat in Rajamundry, Koti Lingala Revu Ghat, Gowthami Ghat, Sunnambati Ghat, Padmavati Ghat and Subbayamma Ghat are the important Ghats in Andhra Pradesh. Special trains by the Indian Railways and special buses by the State Road Transport Corporation are arranged to facilitate and meet the requirement of the pilgrims. Many religious and cultural activities are arranged at these places. 1. Nasik and Triambakeswar in Maharashtra. 2. Basara, Adilabad Dist, Telangana. 3. Sri Mukteswara Swamy temple, Kaleswaram, Karimnagar Dist, Telangana. 4. Sri Narasimha Swamy Temple in Dharmapuri, Karimnagar Dist, Telangana. 5. Sri Sitaramachandra Swamy Temple, Bhadrachalam, Khammam Dist, Telangana. 6. Goodem Gutta Temple, Adilabad, Telangana. 7. Rajamundry, East Godavari Dist, Andhra Pradesh. 8. Kovvur, West Godavari Dist, Andhra Pradesh. 9. Pattiseema near Rajamundry, E.G Dist, Andhra Pradesh. 10. Yanam - a town in Puducherry (Pondicherry) Union Territory - mostly lies in the E.G dist of A.P. 11. Sri Hazur Sahib Sikh Gurudwara, Nanded, Maharashtra. 12. Sri Lakshmi Narasimha Swamy Temple, Antarvedi, E.G Dist, A.P. At this place, River Godavari flows in sea waters of Bay of Bengal. In olden days, population of India was less and there was no environmental pollution as well. Having a holy dip in the bathing ghats of the rivers was truly energizing. In the present days, population of the country has increased manifold and so also the alarming situation of environmental pollution. Keeping in view the crowd, pollution of water, clean and hygienic conditions, pilgrims need to take necessary precautions / safety measures for a healthy and safe Pushkara Darshan. The places will be heavily crowded and though the government is taking all necessary measures to facilitate the pilgrims, yet there are a good number of uneducated lot (illiterates) who are either unaware of the health and hygiene or who do not pay much attention to health and hygiene. Those who are visiting Pushkaralu with senior citizens and children need to take extra precautionary measures for a healthy trip. Keep a medical kit in hand with all the necessary / prescribed medicines. Take holy dips / visit the places which are comparatively less crowded. The governments of Andhra Pradesh, Telangana and Maharashtra have made elaborate arrangements and police security for the pilgrims. In case of any untoward incident, you can immediately inform the police and take necessary help from the govt. More than 27 people were crushed to death in the stampede on the first day of Godavari Pushkaralu 2015 in the main ghat at Rajamundry. In spite of elaborate measures / facilities by the govt of Andhra Pradesh, the over enthusiastic crowd rushed through the opened gate which resulted in stampede tragedy. The govt made / is making its best to facilitate the pilgrims and the pilgrims too need to maintain lines for entering into the ghats instead of rushing all at once. Cooperate with the govt and the police to serve you better. 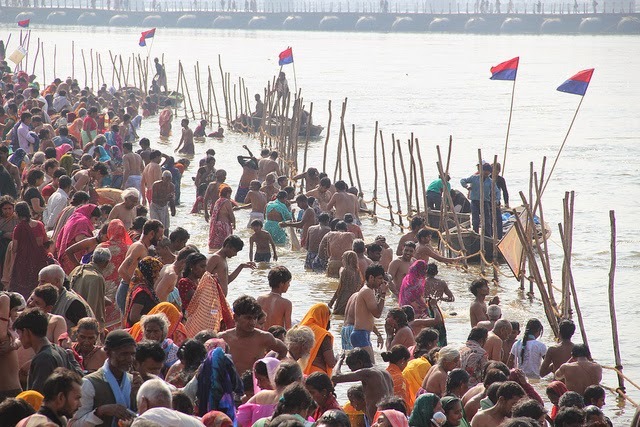 It doesn't make much difference whether you are the first one or last one to make a holy dip in Godavari. It really doesn't make any difference whether you take a dip on the first day of Purshkaralu or on the ending day. If only pilgrims understand such things for the well being of not only their selves but for the well being of the others and maintain disciplined lines / queues in such huge religious gatherings / places, then for sure, they find it much easier to do things.